Don’t let anyone tell you that you can’t achieve greatness. don’t limit yourself. Dr. Kellie Lim received all of her medical training from the David Geffen School of Medicine at the University of California, Los Angeles. After getting her medical degree, she completed her internship and residency in pediatrics before pursuing fellowship training in allergy & immunology and pharmacology. Today, she works as an allergist-immunologist at UCLA Health. The opinions in this article are solely those of the author. (CNN) If you had asked me 20 years ago where I would be, I never would have imagined I would be a physician working at UCLA Health, one of the best medical centers in the country. For over 25 years, my physical disability threatened to define who I was and what others thought I could become. I grew up in Michigan, in a blue-collar, predominantly Caucasian community with very few ethnic influences. Stereotypes and racism were prevalent, so much so that I was placed in an English as a second language class based solely on my appearance. I actually spoke and understood more English than Chinese. When I contracted meningococcal disease at 8 years of age, however, my school community rallied and gave their unwavering support to adapt to my new circumstances. The infection overwhelmed my body’s defenses, and I became a triple amputee. 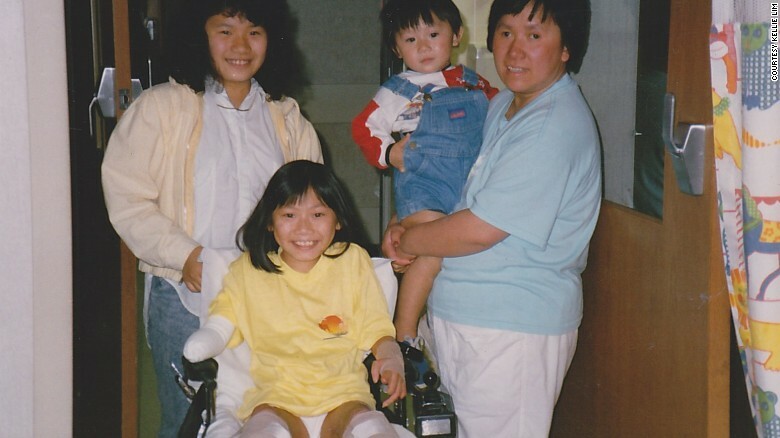 Kellie Lim with her mother, brother and sister after surgery to amputate her legs and right arm. The disease left me with just enough to survive and carry on: two full fingers of the left hand, the thumb and ring finger. Any less would have made it an almost impossible feat to overcome the physical challenges of daily life. Though my success and perseverance have been attributed to my determination to be independent and pursue my passions, I would never have been so ambitious if my family, friends and teachers did not believe in my abilities. The first few years were physically and emotionally grueling; I was in and out of the hospital for surgical procedures to make my lower limbs fit better into prosthetic legs. I had to go to occupational and physical therapy two or three times per week for several years. Yet, through all the tears, fears and exhaustion, my family and friends were there to encourage me and not let me give up. I couldn’t walk for nearly three years. I grew so quickly, my prosthetic legs could not keep up. My father would give me piggyback rides from the car to our house. My mother, who became blind as a teen, learned how to help me dress and put on my prosthetic legs every morning for school. She also made sure I took my medications, as I also suffered from life-threatening asthma attacks. My younger brother, Tarring, would help bring things to me since my mobility was limited. And my older sister, Nellie, was and is my inspiration and role model. She was tough; she gave me strength when I wanted to give up, and she always expected the best from me. Kellie Lim graduates from the David Geffen School of Medicine at UCLA in 2007. I have been extremely lucky to have a strong and resilient family. Both sides emigrated from China and worked in the restaurant business to give the next generation the best chance at the American dream. I was lucky to be in a place where I had great medical care and where I had a community of friends and schools that supported my recovery and believed in my ability to succeed despite my disability. But luck is only part of my success; it takes courage, determination, honesty and integrity to pursue your dreams. As for words of advice: Look back to the past, and use it to draw lessons and strength, but do not let it determine your future.